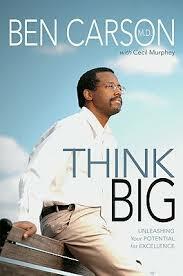 Sitting on my bookshelf right now, gathering dust is a copy of Think Big by Dr. Ben Carson. Only one of a few Ben Carson tomes I’ve been gifted over the years. As a black man who has been pursuing academic science for a pretty good chunk of my life, it’s almost a foregone conclusion that friends and family members have buffeted me with the good doctor’s musings. In hindsight, the books weren’t particularly well-written and Think Big especially is filled with hackneyed platitudes, but I devoured every word as a kid. Considering myself a young scientist from an early age, I found in Dr. Carson an all too rare contemporary role-model, and in speaking with many of my scientific colleagues who share a similar background to me, I was not alone. I even watched that treacly 2009 biopic Gifted Hands with Cuba Gooding Jr. and loved it. Ugh. That should tell you something. Relevant role-models were at such a paucity that I latched onto Dr. Carson with a fervor. Of course, if you’ve followed the news at all in the past few years, you know where this goes. Having Dr. Carson as a hero lost its appeal as I got older. Disillusionment set in once I realized that many of my beliefs came in direct conflict with the ideas he began to espouse publicly and in writing. It was less of a gut-punch and more of a slow-burn; I was gradually watching someone I viewed as a paragon turns into a champion of respectability politics and harmful social beliefs. It’s no secret that Dr. Ben Carson espouses very problematic and ill-informed political ideas and his chosen affiliations don’t paint him in any better light. His recent comment referring to poverty as “a state of mind” typifies the type of commentary he often delivers; the comment not only ignores the institutional and economic factors that contribute to American impoverishment but it is also dismissive of hard-working individuals who just can’t seem to get ahead. Not only this, but his recent uneasy alliance with Donald Trump speaks volumes as Trump has shown to be remarkably anti-science and anti-accountability; two cardinal sins that I find unacceptable. However, that isn’t to say that he is utterly unworthy of admiration or accolades. Dr. Carson overcame enormous odds growing up in poverty in Detroit and struggling in school to become by all accounts one of the most accomplished and skilled neurosurgeons in the world. He also gives back regularly through philanthropic efforts and outreach programs. No wonder, so many of us were so enthralled. He was someone who was raised in similar circumstances to me, with similar hardships and struggles, and similar interests. It was easy for me to relate to him and even easier to admire him because he triumphed over many of the same problems I struggled with as a child. Dr. Carson represented a changing of the scientific landscape; his presence helped me realize that people like me could make it in a field that seemed so devoid of diversity. This is where a conflict arose in myself and one that uniquely and disproportionately affects marginalized groups. The conflict doesn’t involve how to separate someone’s good work or good deeds from their toxic beliefs or actions, that’s a different discussion altogether and one I’m still struggling to have with myself. The conflict that I find more pertinent involves the fact that marginalized people have to make that distinction because we do not have the luxury of choice; there are just so few of us out there. Underrepresented groups must do double-duty in both being more critical and more forgiving of our idols because there’s more at stake and because we feel we “owe it” to them. It’s not just a matter of personal preference for us; underrepresented minority groups are continually having to consider the impact these individuals have on their respective communities. We are uniquely equipped to live in a world of grey areas because of the mental gymnastics we are made to perform just by participating in institutions that have not been historically accommodating of the needs of marginalized individuals this extends to the vetting of our role-models. Weighing the pros and cons of the very few prominent figures and assessing whether their positive impact overrides the negative is a daily reality for me and for those who belong to groups who lack representation. In my case, this process eventually led me to discard Dr. Carson as a personal hero, but others in my community may have made the opposite choice. That’s not a choice I can agree with but, nowadays, I can’t say that I fault anyone for making it. Mainly because I’ve come to realize that my dissatisfaction with having to make this choice is ineffectual when aimed at individuals like Dr. Carson; the root of the problem is much, much larger. Marginalized groups are put into this position of choice as a result of institutional and societal forces that prevent our representation - and the need for that representation is great. Add this to the already mountainous pile of indignities, concessions, and restrictions that marginalized groups contend with. It’s another narrowing of our hallways, a closing-in of our walls and a shrinking of our windows. This claustrophobia of choice threatens to snuff out our rarefied air and leave us gasping, so we fight by pushing against those boundaries and defending what little we have, even if it’s damaging to us and even if the things or people we struggle for are unwilling to return the favor. We cling so tightly to the few role models we have that we sometimes become lax in our critical assessments. I know I was for a long time. With all of this in mind, I grew from loving Dr. Carson to despising him, to eventually feel a sense of sadness and loss towards him. My anger at what I perceived as a betrayal has shifted away from him and towards society at large. I want the same freedom of choice that has been afforded to my more privileged peers. I want to look at the scientific landscape and the media as a whole, to see faces like mine staring back at me. I don’t want to have to hem and haw over the Dr. Ben Carson’s of the world to only to have to concede that he may not be someone that accurately and positively represents me or my community. I want to see more Dr. Mamie Phipps Clarks and Dr. Mae Jemison’s and be confident in my pride and admiration. Sometimes I look back at that book gathering dust on the shelf and pick it up, thinking that maybe I should crack it open, give it another shot, gain back some of that respect that I lost and find the good. Then I feel those walls begin to close around me once more. And I set the book down again. For those who come from marginalized communities, have you felt like you had to choose among a limited number of role models? How do you think increased representation would've impacted your perception on what you could achieve? Have you excused role models due to pressures mentioned in this article? For those who don't come from these communities, is the lack of role models something you've considered to be an issue for scientists of color? How do you feel you can relate to this experience?